The United States has its roots in Chesterfield County – including Pocahontas, the first tobacco crops, the first established college, the first American hospital, the first railroad in Virginia, and of course, the Civil War! Diverse attractions. From prominent Civil War battle sites to a variety of family-friendly events and activities, there’s always something to do here. Framed by the James and Appomattox Rivers, Chesterfield County is surrounded by the gifts of Mother Nature. Within its 446 square miles, there are 20 public parks - including Pocahontas State Park, a true haven for nature lovers. Golf, golf and more golf. 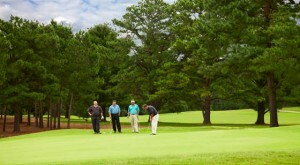 Central Virginia has more public and private golf courses than you could imagine! The Chesterfield County Museum. It features Native American artifacts and covers 400 years of county history. The Dutch Gap Conservation Area. 810 acres of diverse woods, wetlands and wildlife. The area includes a blue heron rookery, the 4.5 mile Dutch Gap Trail, and the 2.5 mile Lagoon Water Trail. Iron Bridge Plaza Shopping Center. It’s minutes away and has everything you need, from the supermarket to the bank to the hair salon. The Metro Richmond Zoo. Home to over 2,000 animals and open year round.